"Mummy! I ate all my breakfast and lunch from my bento box! It was so delicious!" 3 containers were polished clean and she did not share her food this time. Good job! I should be so grateful. But. But. But. I do not like creating the kawaii ones at 6am! It would be so nice if I have someone else to delegate this arduous task to. Wishful thinking, I know. At 6 am, my creative self is still asleep!! There were 2 teddy bear-shaped cheese sandwiches at the back, and even they were still lying down fast asleep. There was another container with cute carrots, baby corn and broccoli but I was running late, gulped my coffee down just as Bean was waking up crying and looking for me. Then a quick feed and I rushed out the door to send Girl to The Big School. The Other Half sent Bean to his Playschool. That explains the absence of photograph of the second container. The third container stored a dozen almond nuts. Also not photographed. Wish me bento luck for Day 2. Can you believe I have to jot all these down so that I can start the rotating bento menu? Bravo!!! 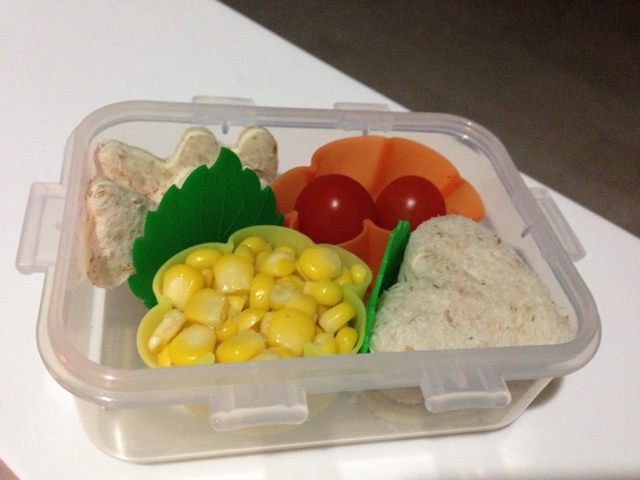 Been wanting to make cute bento for Laith... perhaps someday i will.